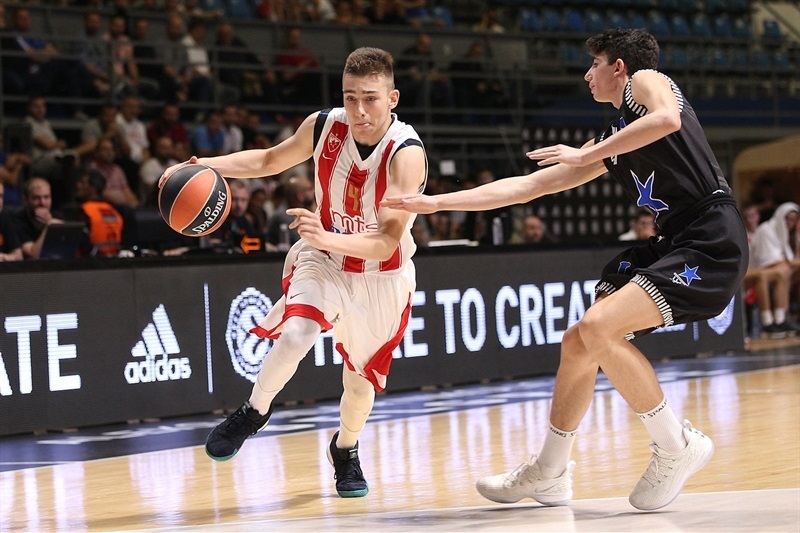 U18 Stellazzurra Rome booked its ticket to the Euroleague Basketball Adidas Next Generation Tournament Championship Game by finishing Group B play with a perfect 3-0 record after beating U18 Crvena Zvezda mts Belgrade 64-75. Luca Conti paced Stellazzurra with 23 points and 5 rebounds while Dalph Adem Panopio nailed four three-pointers in scoring 19 points to go with 5 assists. Russel Tchewa added 8 points and 8 rebounds and Paul Eboua chipped in 4 points, 10 rebounds and 2 blocks. 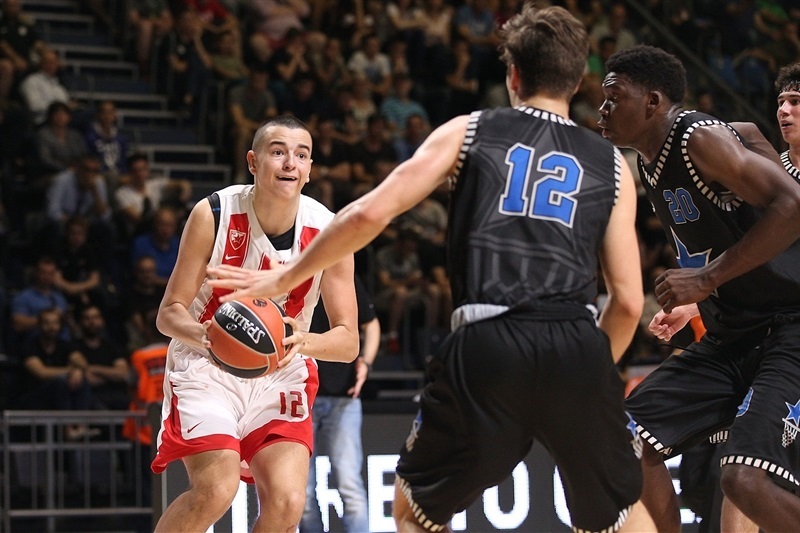 Stellazzurra, which did not win a game in its first ANGT Finals showing in 2015, will next take on U18 Lietuvos Rytas Vilnius to decide the 2018 champion. 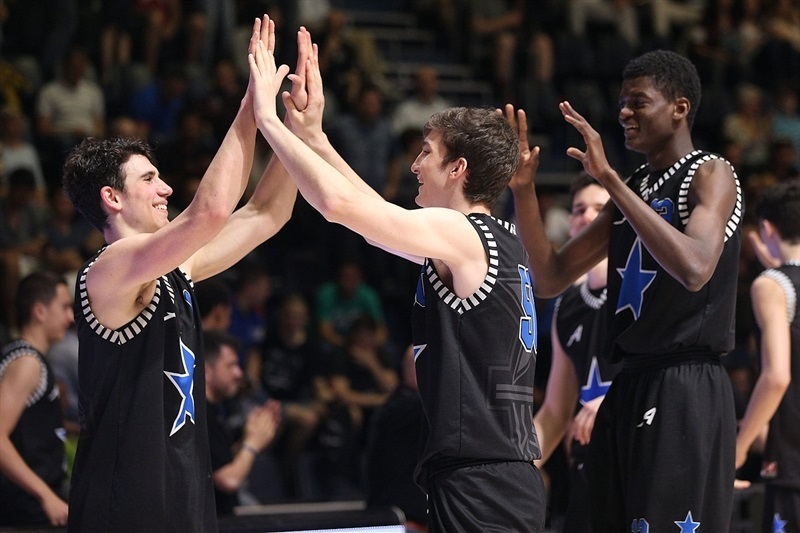 The Championship Game, which will be played at Stark Arena at 10 am on Sunday, will be a rematch of the final of the ANGT Kaunas, which was won by Lietuvos Rytas 76-55 in January. 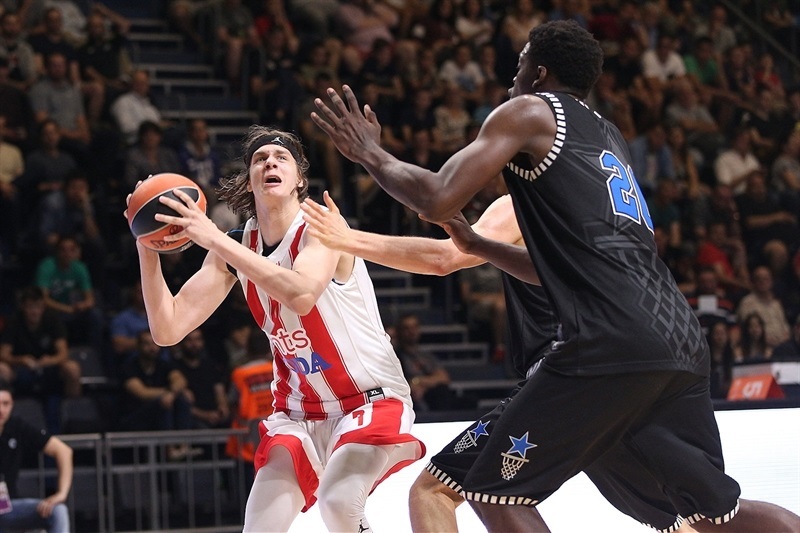 The 2014 continental champion Zvezda ended the group with a 1-2 record despite Arijan Lakic picking up 15 points, 8 rebounds, 2 assists and 2 steals. 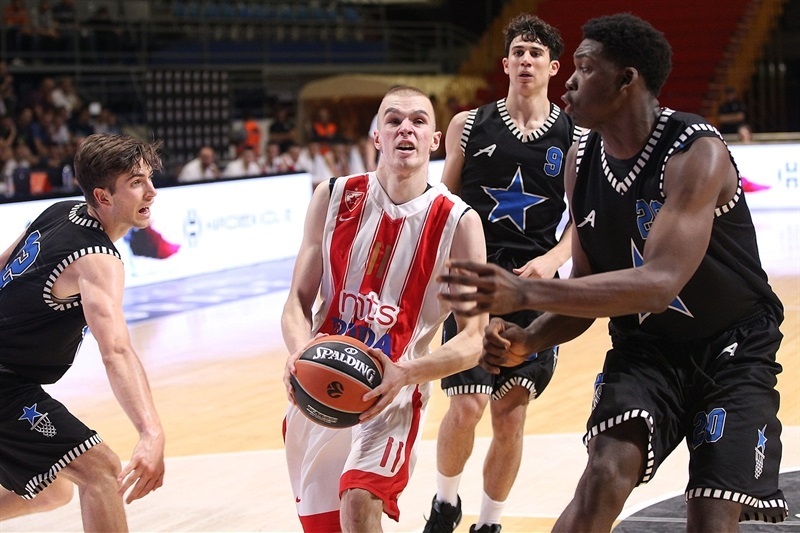 Nemanja Popovic added 14 points while Zvezda star Zoran Paunovic was held to just 5-of-14 shooting with 11 points, 6 rebounds and 3 assists. After Zvezda jumped ahead 9-5, Conti scored nine points in a 2-14 run as Stellazzurra went up 11-19. Zvezda fought back to within one point but was trailing 20-24 after 10 minutes. 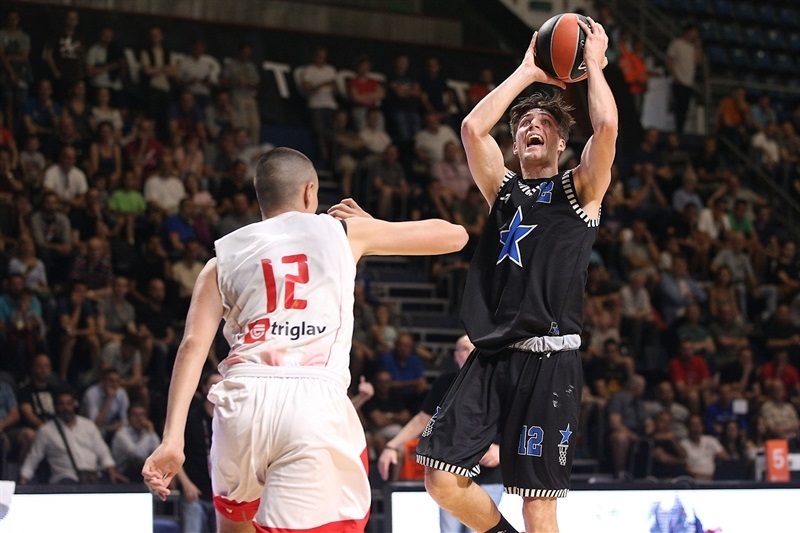 The Belgrade team picked up the first six points of the second quarter and led 26-24 before Alessandro Cipolla responded with two three-balls as Stellazzurra was up 28-33. Lakic and Paunovic however both completed three-point plays as Zvezda used an 8-0 close to the first half to lead 42-37 at the break. The Zvezda margin was up to 46-39 before Tchewa and Panopio combined for all nine points in an 0-9 run to go up 46-48. Panopio added two more three-balls as the lead swelled to 52-60. It was 56-60 after 30 minutes. Conti hit back-to-back baskets in the fourth as the Stellazzurra defense kept Zvezda in check in opening up a 59-66 cushion. It was up to 63-72 inside the final two minutes and the Stellazzurra defense held up - allowing just eight points in the fourth quarter.